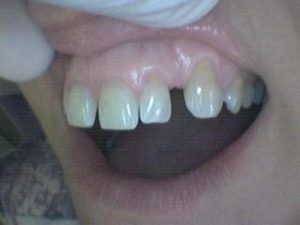 Adult patient unhappy with spaces. 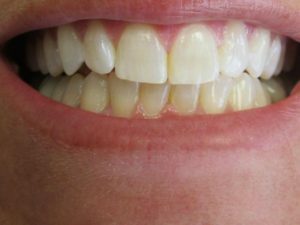 Recommended braces but patient declined. 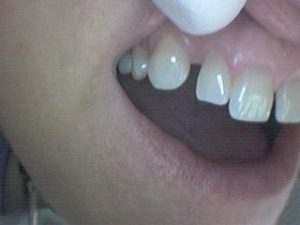 Decided she wanted porcelain veneers. 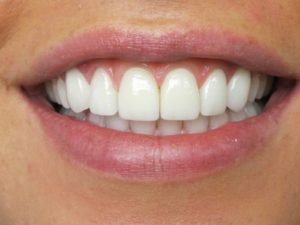 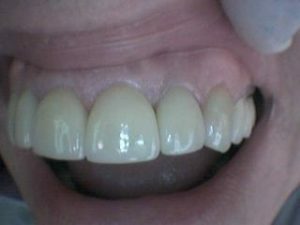 This case was completed in 2 visits with 6 porcelain veneers. 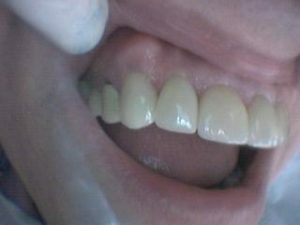 Dentistry performed by Dr. James Bertini. 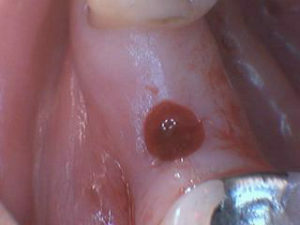 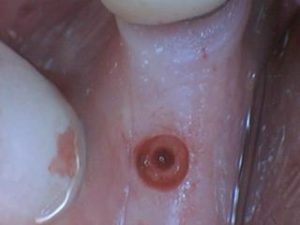 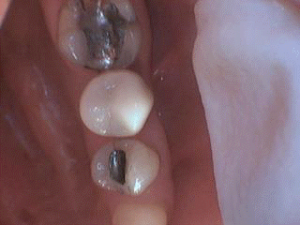 Patient had numerous bondings on front teeth which were chipped and failing with recurrent decay. 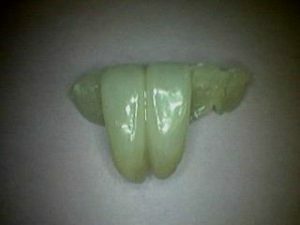 Teeth prepared for full porcelain crowns. 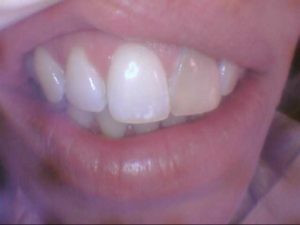 Dentistry performed by Dr. James Bertini. 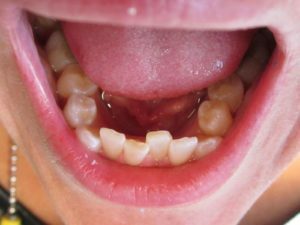 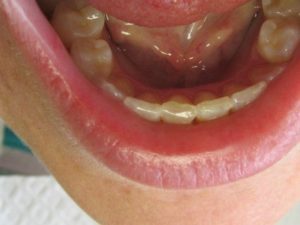 Patient unhappy with 4 front teeth due to misalignment. 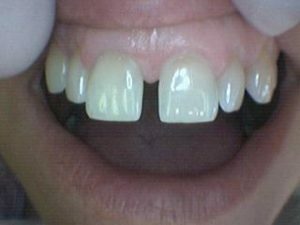 Wanted a conservative permanent option. 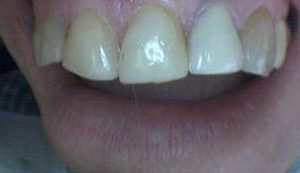 Four front teeth prepared for 3/4 veneer preps, whitening, and minor re-contouring of gums. 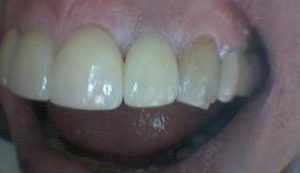 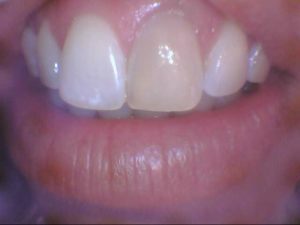 Gums were irritated at the cementation visit (#2) but will heal and look normal in 2-3 days. 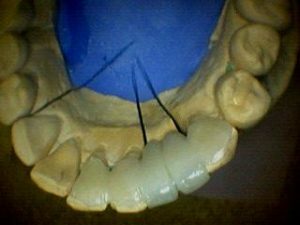 Dentistry performed by Dr. James Bertini. 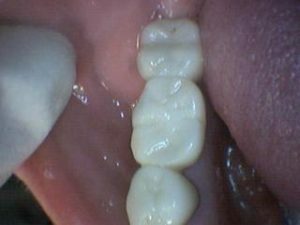 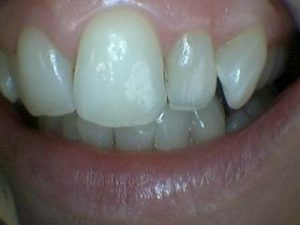 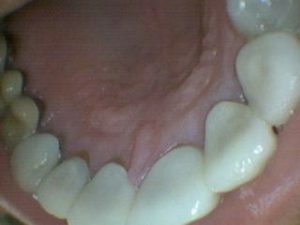 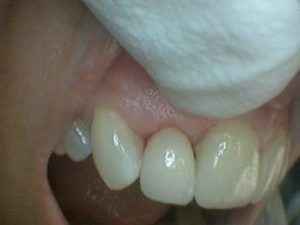 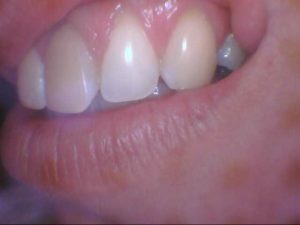 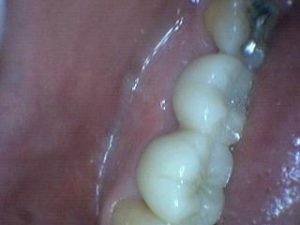 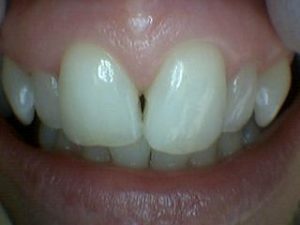 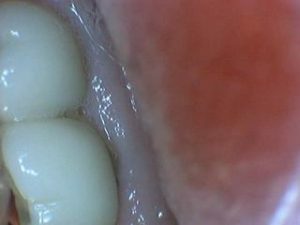 After restoring maxillary teeth, patient wanted conservative solution to space on lower arch. 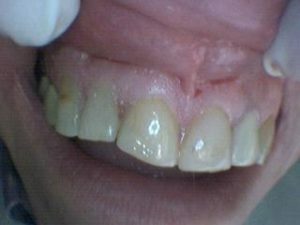 After a lateral incisor was extracted due to prior bone support and mobility, area prepared for a non-metal Maryland Bridge. 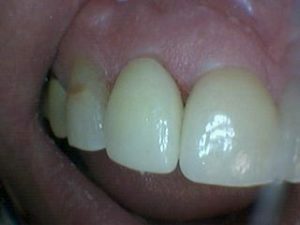 The abutment teeth are lightly prepared on the back surface only and replacement teeth are bonded into place at second visit. 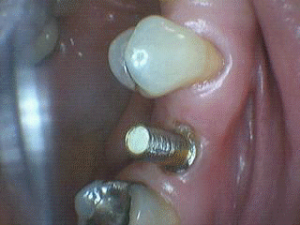 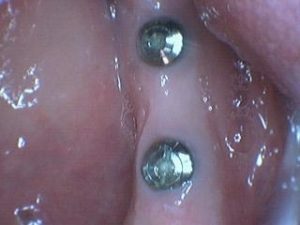 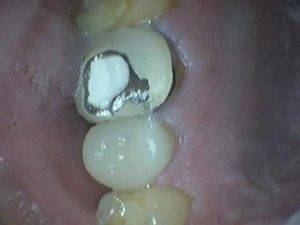 This is an alternative solution to conventional bridge preparations as to preserve tooth structure. 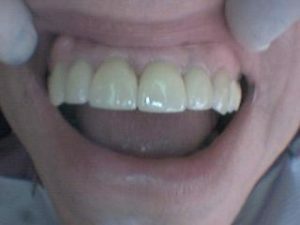 Dentistry performed by Dr. James Bertini. 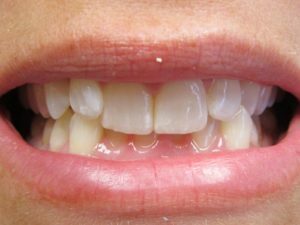 Patient interested in getting 4 front teeth fixed. 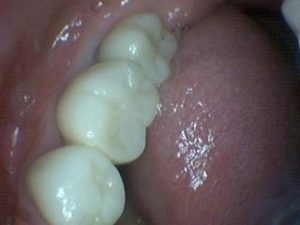 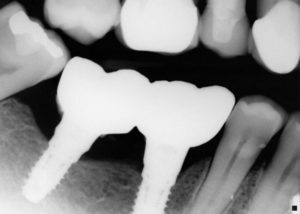 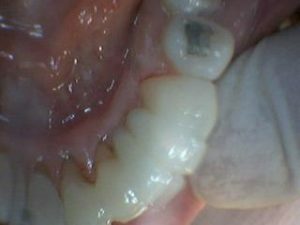 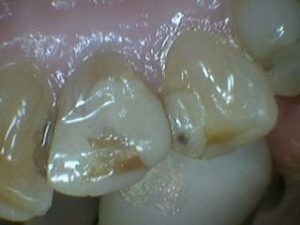 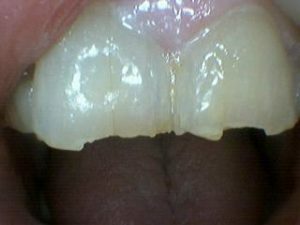 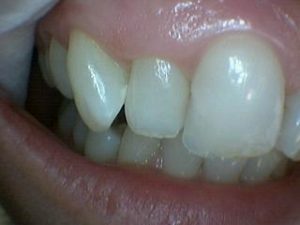 Note old porcelain fused to metal crown on patient’s upper left lateral was too white and no longer matched adjacent teeth. 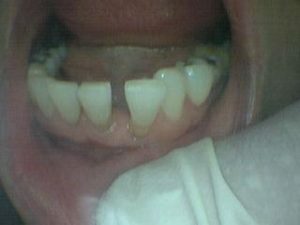 Also note worn and chipped anterior teeth due to wear and tear. 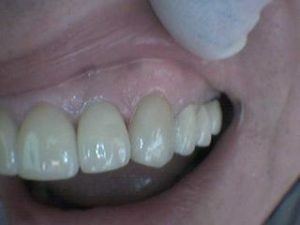 Case completed in 2 visits with 4 all-porcelain e-max cadcam crowns. 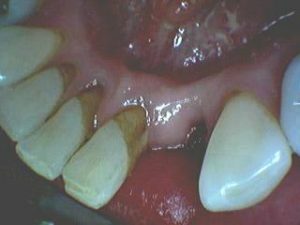 Next treatment for patient to consist of preparing both canines to match remaining teeth. 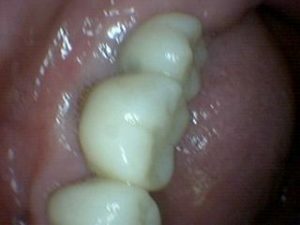 Dentistry performed by Dr. James Bertini. 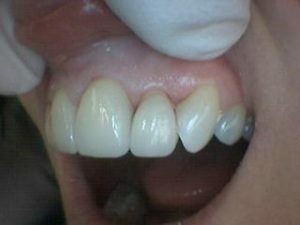 Patient came back to complete treatment for upper canines. 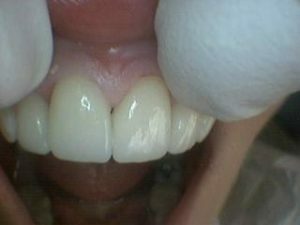 Case completed with EMAX crowns. 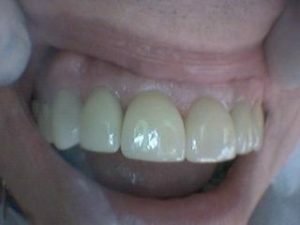 Final case of 6 anterior crowns. 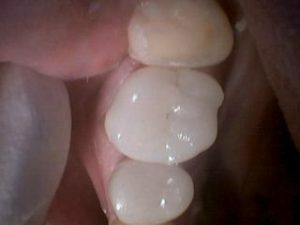 These crowns are fabricated with a computer designed software. 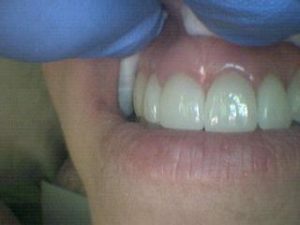 Dentistry performed by Dr. James Bertini. 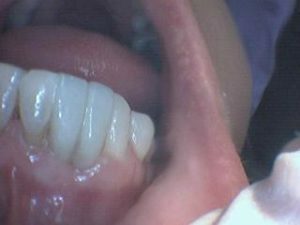 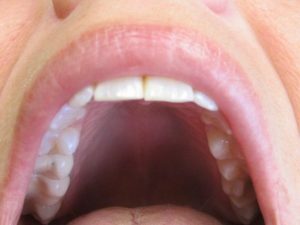 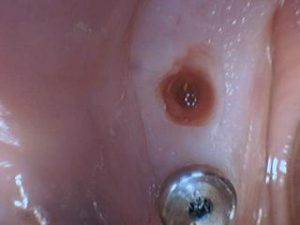 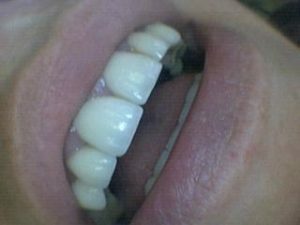 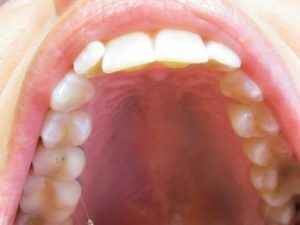 Patient’s chief complaint was she would not wear her lower, removable denture. 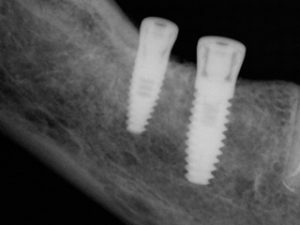 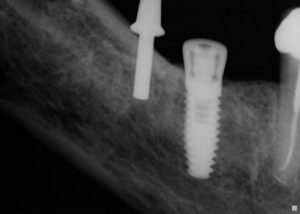 Dr. Bertini placed 2 endosseous implants on the lower right area. 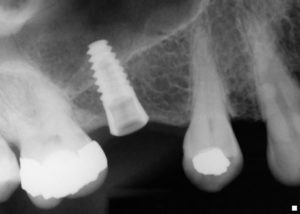 Phase II will be to place 3 implants on the lower left area and then restore with permanent crowns. 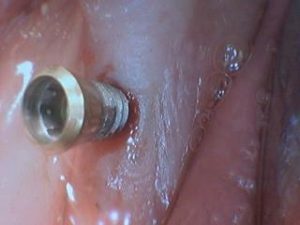 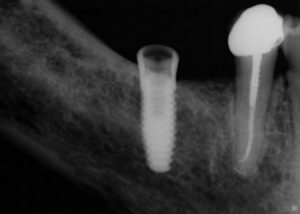 As you can see, the area is prepared for the implants by a small opening in the gum tissue through which the implant is inserted into the bone. 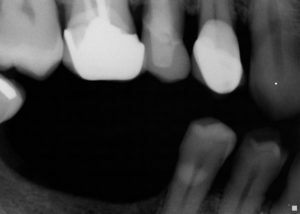 This case took less than an hour including anesthesia. 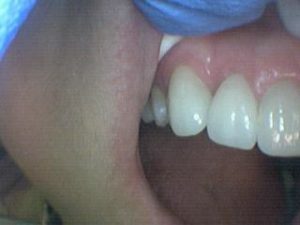 Dentistry performed by Dr. James Bertini. 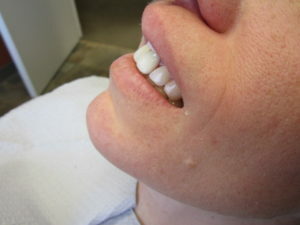 Patient #8 interested in having 2 missing teeth replaced on lower right with implants. 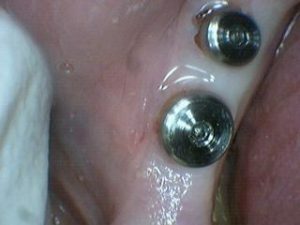 Pictures show 2 all ceramic (non-mental) crowns placed over 2 custom titanium abutments. 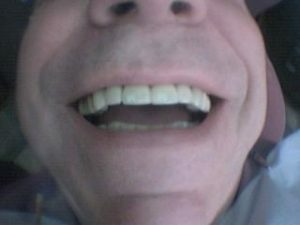 Dentistry performed by Dr. James Bertini. 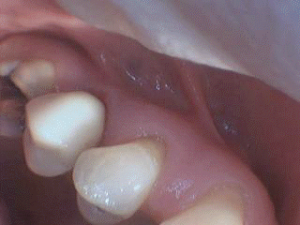 Female patient was not happy with uneven teeth that were wearing at an accelerated rate. 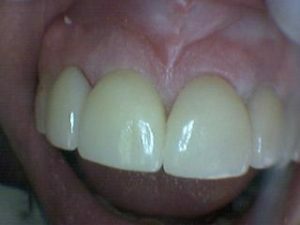 We did a combination of porcelain crowns and veneers to restore missing structure and achieve excellent esthetic results. 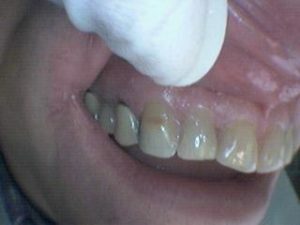 Dentistry performed by Dr. Peter Galdoni. 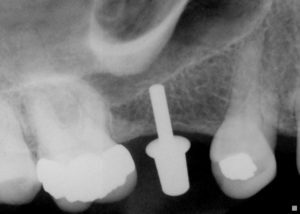 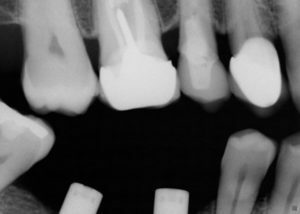 Patient wanted to fill missing space with implant. 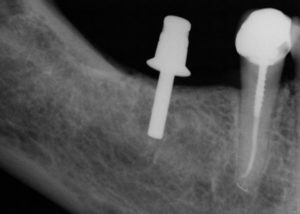 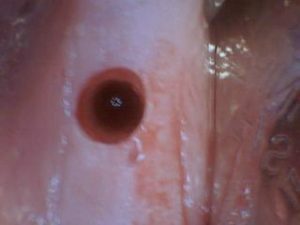 Implant was placed on the upper left side. 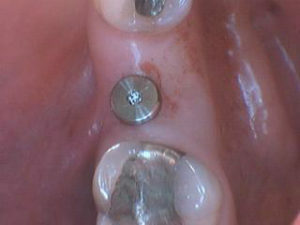 Before placing the crown an abutment is inserted to extend the implant, this is what the crown will adhere to. 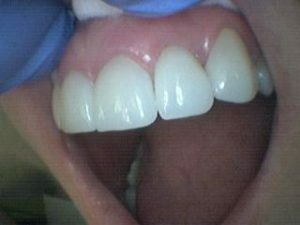 Dentistry performed by Dr. James Bertini. 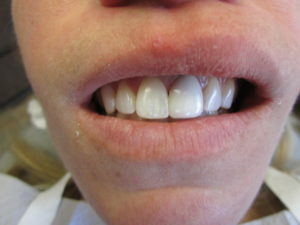 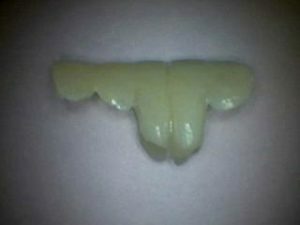 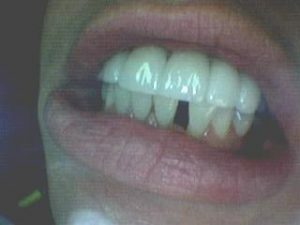 All porcelain veneer was placed on discolored natural front tooth to match rest of front teeth.